A charming foliage plant that was added to our courtyard in July 2013. 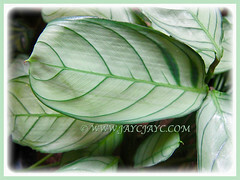 Though its variegated leaves aren’t that dramatic, the dark green fishbone pattern set against a light greyish-green background certainly attracted our attention and curiosity! 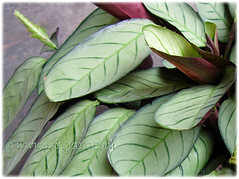 The purple-coloured underside of its leaves is an added bonus, to say the least. We gladly brought a pot of ‘Amagris’ that costs only RM5 home, knowing for sure that these unusual foliage plants with remarkable variegation will compliment a crowd of other green plants that reside at our courtyard. They thrive well at this location which receives brief sunlight, depending on the planet’s motion around the sun. Air circulation here is rather cool and isn’t as dry as our garden at the front yard. 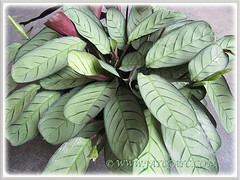 Common Name: Ctenanthe Amagris, Fishbone Prayer Plant. Etymology: The genus name, Ctenanthe comes from the Greek words, kteis, ktenos, meaning a comb–flower, referring to the bracteate flower-head. The species epithet, burle-marxii is named after the Brazilian landscape architect Roberto Burle-Marx who discovered the plant. Origin: Native to southeastern Brazil. The cultivar ‘Amagris’ is a chance mutation of Ctenanthe burle-marxii in a Belgium tissue culture laboratory. 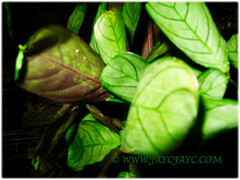 Plant type: A herbaceous evergreen perennial. Features: Ctenanthe burle-marxii is a species of the genus Ctenanthe that comprises of about 15 species of flowering plants. These are popularly grown for their exquisitely colored and patterned foliage, and have encouraged hybridisers to produce numerous varieties and cultivars. ‘Amagris’ is an attractive cultivar of Ctenanthe burle-marxii, with a slow to moderate growth rate. It has a low and compact plant habit, reaching up to 30 cm tall but spreads much wider. 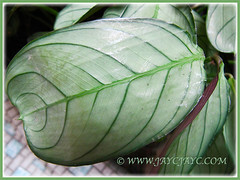 This Ctenanthe cultivar has strikingly beautiful oval-obovate to oblong, pale greyish-green leaves, and distinctively marked with dark green stripes that are thin and dainty-looking. The light greyish-green leaves with dark green margins and fishbone or herringbone venation on the upper surface is delightfully attractive. 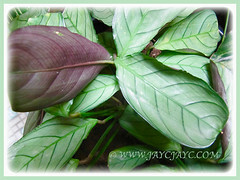 The underside of leaves are purple in colour, usually seen at dusk when the leaves are folded upright. The simple and leathery leaves are held on long petioles of varying lengths. The bracted flowering spike produced by this Ctenanthe cultivar is inconspicuous. Under good growing conditions, it’ll flower intermittently throughout the year. As with several species of the Marantaceae family, Ctenanthe burle-marxii ‘Amagris’ has the characteristic feature of folding up their leaves at dusk to dawn by means of the tiny geniculum, an angular knee-like joint connecting it to the petiole, resembling hands put together in prayer, hence the other common name, Prayer Plant. In the morning the leaves will return to normal position, almost perpendicular to the petioles. Light: Grows best in semi-shade to full shade. 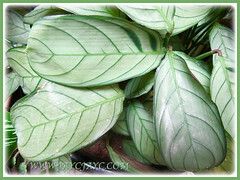 Avoid direct sun that may cause the leaves to curl up or will scorch its foliage. Moisture: Require lots of water regularly but not waterlogged. Soil: Humus enriched, moist and well-drained loamy soils. Others: Remove insignificant flowers and spent leaves as they form. It likes to be pot-bound, so only repot when the need to propagate arises. 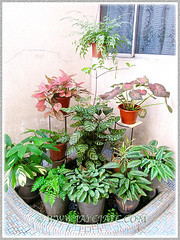 The plant, especially if grown indoors will benefit if mist regularly or the pot is made to stand on a shallow tray of pebbles filled with water to just below the base of pot to maintain humidity, as well as to keep it dust-free. Feed once monthly with a liquid fertilizer for foliage plants. 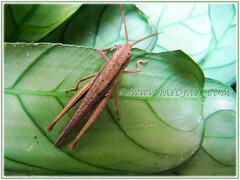 Generally free from serious garden pests. Chewing and sucking insects may be a problem though. For subtropical and temperate regions: Hardiness: USDA Zone 10-12. It can tolerate occasional freeze at -1°C. Since it’s not frost tolerant, it is advisable to grow indoors as a houseplant or in a green house with sufficient light and accepted temperatures. Alternatively, you can pot it outdoors during the hot seasons and overwinter indoors during winter with reduced watering and stop feeding. Repot plants every two years in spring. Propagation: Easily by division of clumps or basal offsets. Usage: Ctenanthe burle-marxii ‘Amagris’ is an excellent groundcover in a shady garden that’s sheltered from the blazing sun or grown in borders under a tree. Its beauty will brighten any dark areas. 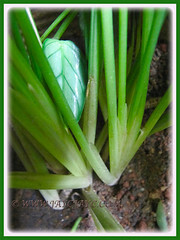 A compact and low-growing plant that is most suitable for container gardening, located indoors or outdoors. 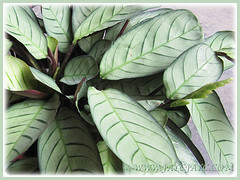 Plant this attractive variegated foliage plant as a houseplant to decorate inside your home, for example, use it as a centrepiece on dining table or on a low coffee table. 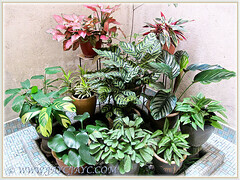 It’ll look lovely amidst a crowd of other foliage plants at the courtyard, patio or deck. 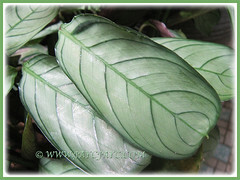 An attractive plant to be added into a greenhouse for non-hardy regions. Plants Rescue on Ctenanthe burle-marxii. GardenDrum with pictures on numerous Ctenanthe species. Chlorophytum laxum ‘Bichetii’ or is it Chlorophytum bichetii?